March 30, 2011 by Alphageek in "alphageek", "discovery", "shopping"
This is going to be one heck of a big post. 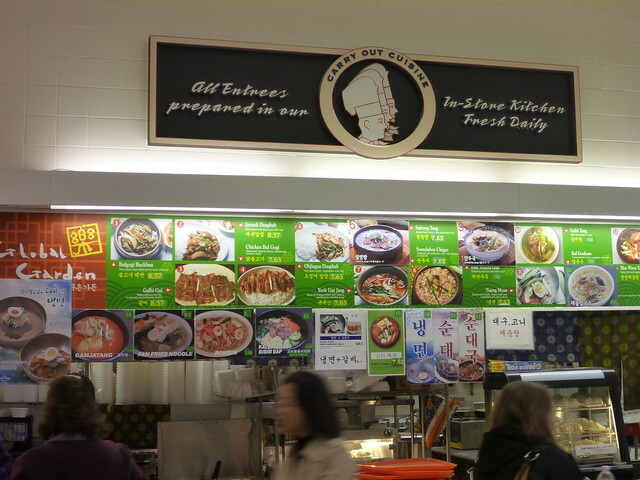 After all, we were at Global Food in Woodbridge, VA to do a little outing for a day. We can't just go to museums like other people, we have to find something adventurous and unique to do. This place is so big, I will just start at the beginning, and try to work in all of the unusual sights we saw. When we arrived, it was time to get some lunch. Sure, we could have stopped at one of the nearby fast food places, but what fun would that be? We walked in, and there are several restaurants right there serving food. Feeling adventurous, we decided to eat at the Korean counter. Well, I think it is Korean, after all I cannot read anything other than english. 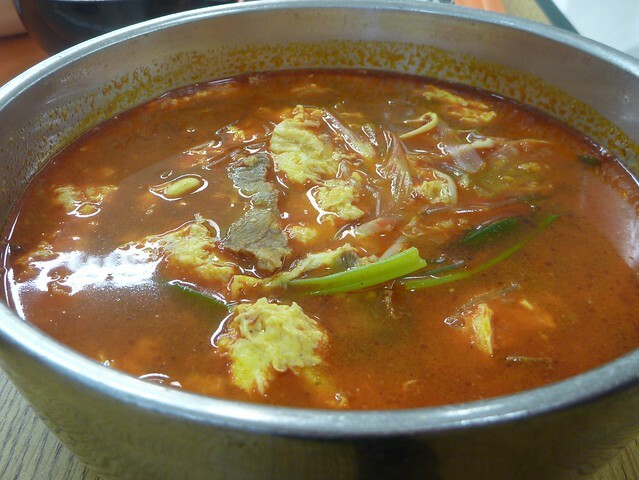 I ended up ordering Yook Gae Jang, which is also known as number 7. You can click on the picture to take a look at the menu up close, if that is your desire. 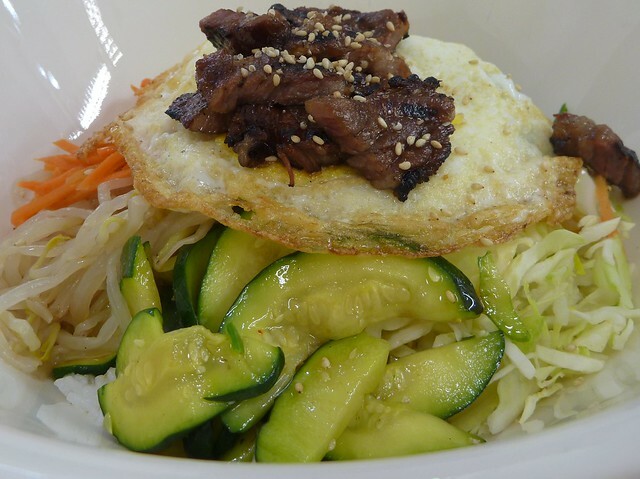 Mrs. Alphageek ordered Bibim Bab, creatively called #14. Mine is pictured here on the left. This is not really a food review today, so I will just say that I enjoyed my soup. It was not nearly as spicy as the picture makes it look, but it was still delicious. Despite what Anthony Bourdain says, I am not sure that the chewy bits of meat are the best part. Mrs. Alphageek's meal is pictured here on the right. The meat was well cooked and flavorful on top of a simple egg. Some of the vegetables were not very Americanized, so this dish was something of a unique taste. While we were here, a gentleman sat next to us wearing a Members Only jacket, which I have not seen since watching my Knight Rider reruns. You can't see this just anywhere. We moved on to the fresh fruit and vegetable section. If you are looking for over ten different kinds of eggplant, you really need to stop by this place. This is the place to go if you are looking to cook something that requires hard to find herbs. They have so many, we lost count trying to keep up. We did notice that they had thai basil, some sort of mint and lemongrass. There also is an incredible amount of exotic fruits. I will just say keep an eye on Alphageek Talks Food for a future spotlight on a purchase from this section. We moved past the vegetable area into another surprising area: the seafood. To say this is something you will not find in just any grocery store. They have a selection of fish that just blew me away. I saw somebody holding some tongs and fishing around in a container. 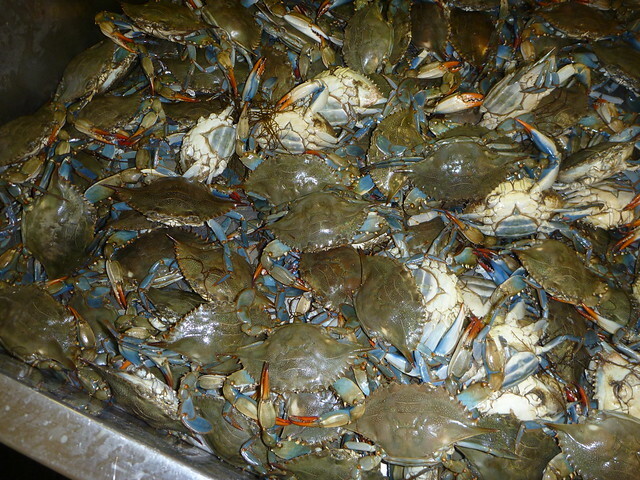 Little did I realize that you could stop by and get some fresh, live crabs. The crabs were walking around, and looking pretty mean. 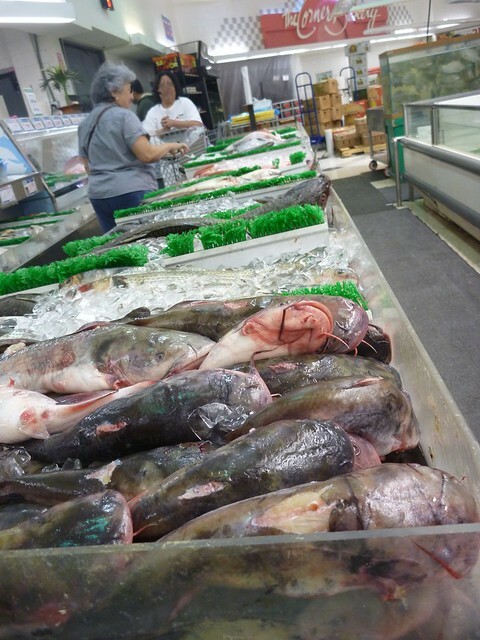 You could also get some fresh fish. The fish were swimming around in a tank. 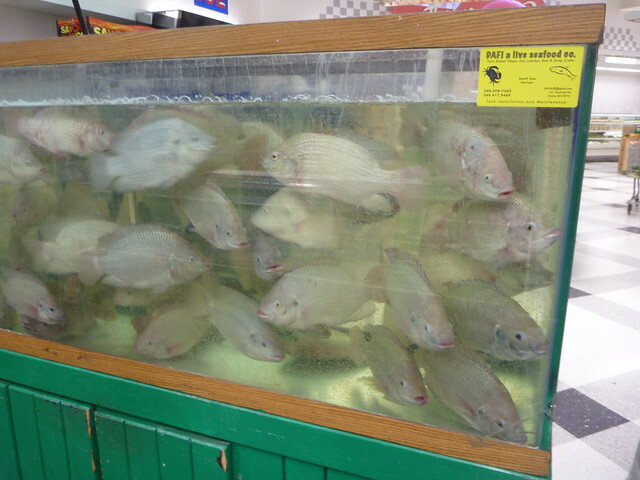 The sign said they were tilapia, which is good because I would not have been able to identify them. They took one look at me and posed for the picture you see below. My curiosity satisfied, I decided to wander over to the aisan spice section. Did I mention they have a lot of spices? This selection is simply insane! 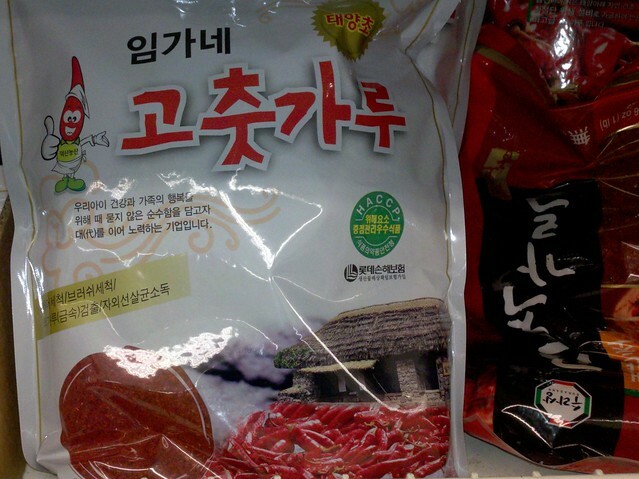 The picture below is a several pound bag of ground hot peppers. I hope you can see the little hot pepper giving the "thumbs up" sign on the package. If you cook frequently, this is a great place to get spices. They had several different sections of spices that I counted. They had Asian, Indian, and Southwest that I counted. The prices of these spices packages can be pennies on the dollar compared to your local grocery, so make sure you make a shopping list before you leave your house. I know some people question the freshness, but I have never purchased spices anywhere that convinced me I was getting an extremely fresh spice that was worth the extra money. We then decided to take a look at the meat counter. One of my favorite things to get here are the unusual cuts of beef. You can get thinly sliced rib-eye that is great for stir fries and soups. I guess you could go to your grocery store and ask for that, but I like to get it here as a special treat. We walked out with several different packages to take home and freeze for later use. Sure, I guess you could cut it at home, but I have never had that work very well. You just cannot beat those deli-type slicers, at least the Alphageek cannot. This is a great place to go for an unusual food adventure. We like to go and try the different foods they have. One of these days, I will have to get brave and buy a live fish to cook up. Make sure to share your experiences below.